A rally with O'Rourke and country legend Willie Nelson was held this weekend. In many ways Austin, Texas, was the last place Beto O’Rourke should have been with just over a month left until a pivotal U.S. Senate election. The deep-blue city, smack dab in the middle of a deep-red state, likely doesn’t have many of the undecided voters the Democrat, whose aggressive challenge to GOP Sen. Ted Cruz has become somewhat of a national fascination, needs to win this November. "This close to the election, the last county he needs to be in is Travis. I think he’s got it in the bag," Texas Tribune CEO Evan Smith said as he introduced O’Rourke at a question-and-answer session Saturday prior to the congressman’s speech and get-out-the-vote rally with country music legend Willie Nelson. (Tom Fox/The Dallas Morning News via Reuters) Rep. Beto O'Rourke makes a statement during a debate with Sen. Ted Cruz (not shown) at the Southern Methodist University in Dallas, Texas, Sept. 21, 2018. But as with many things about the El Paso congressman’s improbably competitive campaign, unorthodox seems to be the status quo. So in front of a crowd estimated at 55,000 people, a truly impressive number for a U.S. Senate race, with the Austin skyline behind him, O’Rourke fired up the crowd with an impassioned speech ticking off a checklist of policies that are simultaneously in line with most of the progressive resurgence within the Democratic Party in 2018, but unique to his Texas-centric campaign: the legalization of marijuana, a renewed focus on climate change and leadership on LGBTQ issues. Later, the congressman capped off the night with a rendition of “On the Road Again” with Nelson and his family band. Nelson himself debuted a new song he called "Vote 'em Out," telling the crowd, "If you don’t like who’s in there, vote ’em out. That’s what Election Day is all about. And the biggest gun we got, is called the ballot box, if you don’t like who’s in there, vote ’em out." The ultimate success of O’Rourke’s progressive pitch to Texas’ more far-flung reaches is a test of his own communicative skills and the appeal of that platform to a broader and decidedly un-liberal audience outside the urban enclaves like Austin and the congressman’s home city of El Paso. 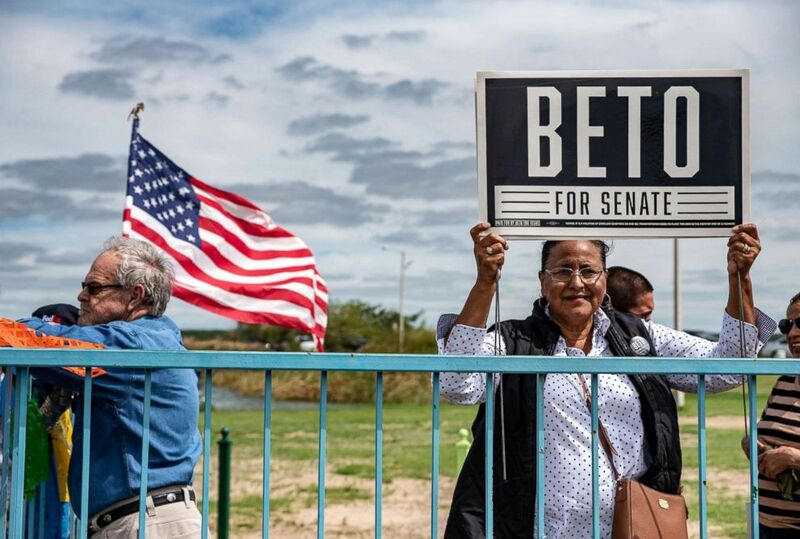 (Sergio Flores/Reuters) A woman holds up a sign supporting Beto O'Rourke at an event in Eagle Pass, Texas, Sept. 22, 2018. The embrace of those progressive policies is a gamble on a state that has changed drastically in the last two decades -- becoming younger and more diverse -- but one that Democrats have not scored a statewide victory in since 1994. 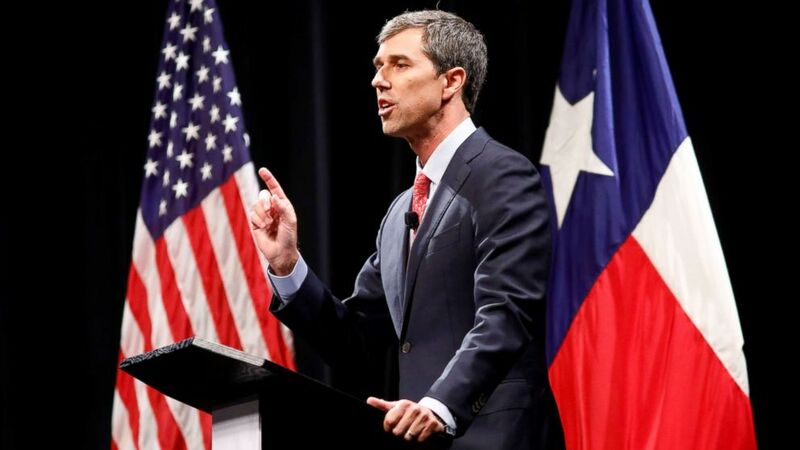 If it fails it will be held up as an example of the limitations and shortcomings of Democratic appeal in states like Texas, but even a race that winds up within a few points will indicate just how far Democrats can go with the right candidate delivering a genuine message. It’s a gamble that early on in the campaign was scoffed at by Cruz and his campaign, who have sought to paint O’Rourke as an irresponsible liberal, hammering home an economic and cultural message that includes a vehement defense of the Republican tax cuts, a hard-line pitch on immigration that includes support for building a wall on the southern border, and a healthy dose of tongue-in-cheek humor that included the senator ominously warning that O'Rourke wants to turn Texas into California, "right down to the tofu and silicon and dyed hair." But at the last debate between the two in Dallas, Cruz conceded that "We have a real race in the state of Texas." (Tom Fox/The Dallas Morning News via AP) Sen. Ted Cruz takes part in a debate for the Texas U.S. Senate with Democratic Rep. Beto O'Rourke, in Dallas, Sept. 21, 2018. Hyperbole and jokes aside, Cruz's pitch is tailored to a decidedly different swath of the state's electorate, which the GOP is quick to say will likely re-elect its Republican incumbent governor by a wide margin this cycle. A Democratic candidate for the U.S. Senate in Texas hasn't earned more than 43 percent of the vote this millennium. In some ways O’Rourke’s campaign embodies the debate raging within the Democratic Party about the need for a new generation of leadership and a real commitment to policies it remains skittish about adopting wholeheartedly, like Medicare for All, which O’Rourke says he backs. But in other ways the candidate tries to shirk partisanship all together. "If you’re a Republican, we say you’re in the right place, if you’re a Democrat we want you here, Independents welcome," O’Rourke said, a version of a line he often repeats on the campaign trail. When asked to place himself on the progressive-establishment spectrum of the Democratic Party, O’Rourke demurs: "I place myself in Texas," he says. It’s an unspecific answer, but one that reiterates that he is running a campaign convinced that the voters it needs to attract and turn out are mostly ones uninterested in political tribalism and adhering to the party line. Recent polls have shown Cruz maintaining a slight edge over O’Rourke, but FiveThirtyEight and other election analysts rate the race as a “Toss-Up,” adding fuel to Democratic hopes that this 2018 is the year they finally break through. It’s a question that O’Rourke himself acknowledges he does not have the answer to. "I don’t know that I’m the one, but I think this is the year, and we are the people," O’Rourke said as he spoke of campaigning in Republican-dominated towns like Abilene, towns that glow such a deep shade of red "you can see it glowing from outer space." Texas is a state full of complications, contradictions and complex history, and the race between O’Rourke and Cruz, men just two years apart in age, is much the same. It is a race that features a white man with a Hispanic nickname given to him as an infant taking on a Hispanic man named Rafael that instead goes by the name of Ted. 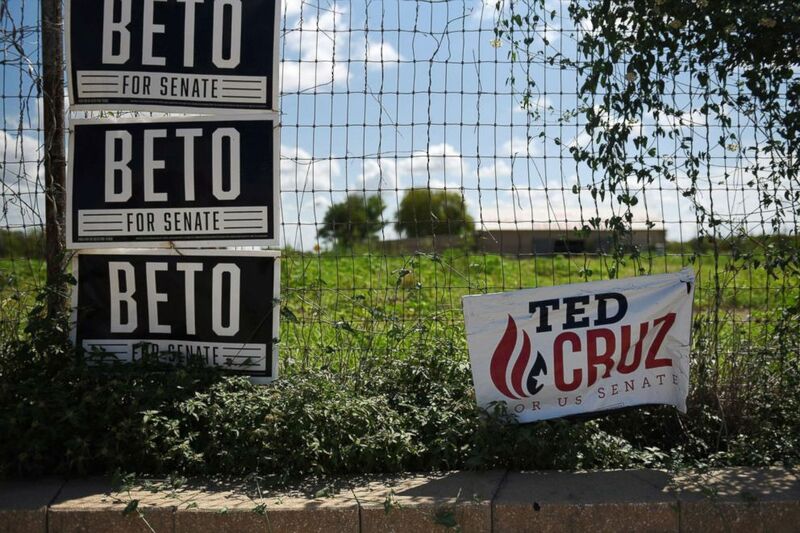 (Callaghan O'Hare/Reuters) Ted Cruz and Beto O'Rourke election signs are seen near downtown Carizzo Springs, Texas, Sept. 5, 2018. It features a Democratic candidate that often warns of how technology has made our society disconnected and disjointed from one another, but vaulted to the national consciousness in part because of his campaign’s effective use of social media and seemingly non-stop string of livestreams and viral clips of his speeches. It’s those confounding and fascinating things about Texas, a state that has been at the forefront of so many of the most politically charged issues that have taken on a new level of urgency in the era of President Donald Trump -- from immigration to health care to gun violence -- that have captured the attention of not just people across the country, but also some of the most prominent members of the Democratic Party, who are eyeing it as a bellwether for how big a supposed wave may be this cycle. "There are a lot of races. ... 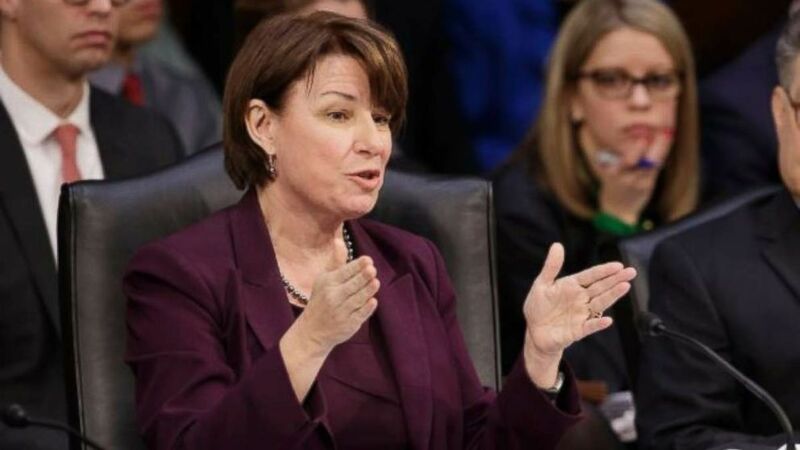 This one is just kind of a sleeper race that came up where everyone is awake," Minnesota Democratic Sen. Amy Klobuchar said this weekend. (AP) Democratic member of the Senate Judiciary Committee Sen. Amy Klobuchar, D-Minn., questions the Republican side on Monday, April 3, 2017, on Capitol Hill in Washington. "If Beto O’Rourke wins in Texas, the indication is ... we definitely have the Senate," House Minority Leader Nancy Pelosi predicted. Republicans both in and out of Texas say the congressman’s carefully orchestrated rise from local councilman who unseated a longtime Democratic incumbent to earn his seat in Congress, to U.S. Senate hopeful demonstrates that his campaign is nothing more than a liberal cause célèbre. But there are some high-profile members of the GOP who have expressed concern that Cruz is just now taking the race seriously. "We're not bluffing, this is real, and it is a serious threat," Cruz's Texas colleague and Senate Majority Whip John Cornyn told Politico last month. "If Ted does his job and we do ours, I think we'll be fine. But if we have donors sitting on the sidelines thinking that, 'Well, this isn't all that serious,' or 'I don't need to be concerned,' then that's a problem." A new rush of money has begun to flood into the state from conservative groups like Texans Are, giving more credence to the idea that the GOP knows the race will be close heading into the final weeks. The concern among Republicans has also trickled down to competitive House races across the state as well. Democrats are eyeing no less than five GOP-held congressional seats this cycle, fielding candidates that, like O’Rourke, are pitching themselves as harbingers of a new direction for the Democratic Party. "We know we are being tested, who are we as Texans? ... We’re asking some of those existential questions," Gina Ortiz Jones, the Democrat in Texas’ 23rd Congressional District, which spans some 800 miles along the U.S.-Mexico border, against Republican Rep. Will Hurd, said Saturday at another Texas Tribune moderated panel in Austin. But tested also are those candidates’ willingness to commit to that change within the leadership of their party. Jones and four other Democratic congressional candidates alongside her -- Collin Allred, MJ Hegar, Joseph Kopser and Lizzie Pannill-Fletcher -- were asked if they’d support Pelosi as the next Speaker of the House if the party retakes the House in November. 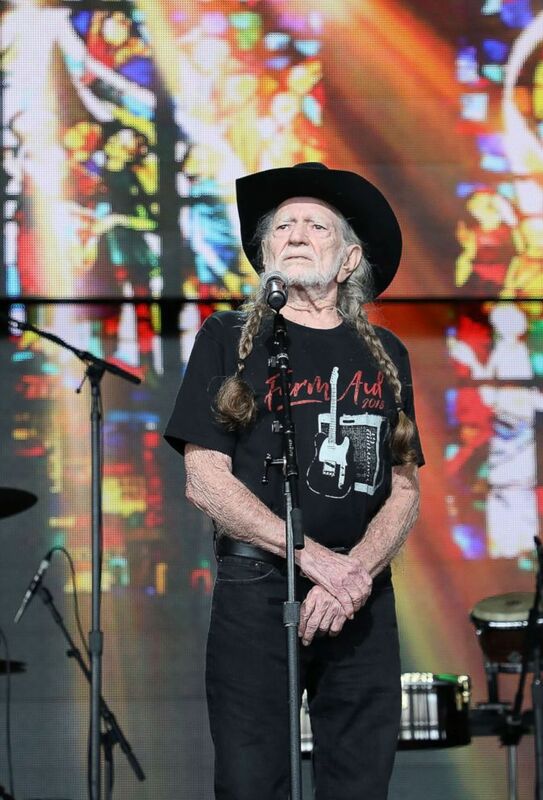 (Taylor Hill/Getty Images) Willie Nelson recites The Lord's Prayer to open Farm Aid 2018 at Xfinity Theater on Sept. 22, 2018 in Hartford, Conn. Earlier that day Pelosi said she anticipated that she "will be the person with the gavel" come November. All of the candidates bristled at the problem, most saying it's not one they get from voters on the campaign trail, and four of the five said they are waiting to see who throws their name in the ring, while Kopser was the only one to say definitively that he will not support Pelosi if elected. But all five, like O’Rourke, say the way to win this cycle is to show up in areas where Democrats have feared to tread in the past. “Their eyes got as big as saucers, because they’re not used to seeing a Democrat show up that far out,” Kopser, who is running in the open seat currently held by GOP Rep. Lamar Smith, said about approaching a Republican float at a Fourth of July parade in a rural Texas county. 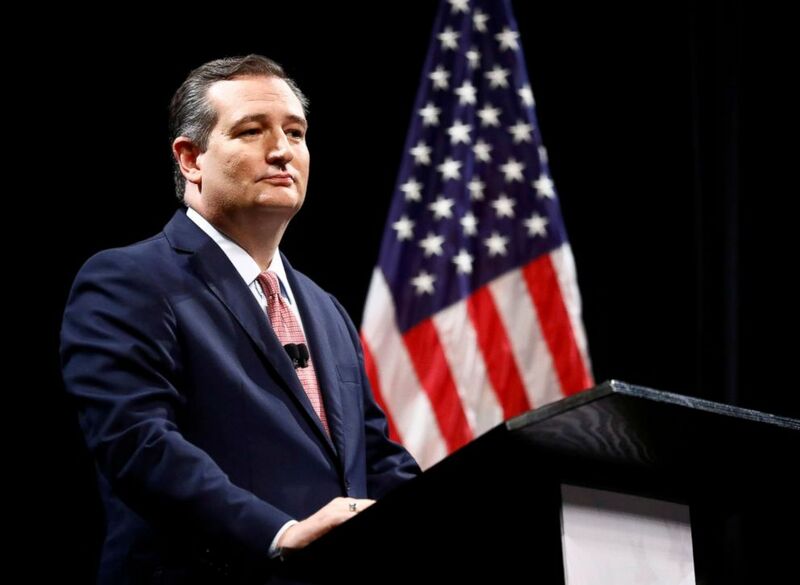 Cruz and O’Rourke were set to debate for the second time on Sunday, but the event was postponed due to the uncertain vote schedule and drama surrounding the nomination of Judge Brett Kavanaugh to the U.S. Supreme Court. That and one additional debate, plus a looming visit promised by Trump, will be key moments in the contest’s final days. I will be doing a major rally for Senator Ted Cruz in October. I’m picking the biggest stadium in Texas we can find. As you know, Ted has my complete and total Endorsement. His opponent is a disaster for Texas - weak on Second Amendment, Crime, Borders, Military, and Vets! As the final month of the campaign approaches, there will be no shortage of speculation and prognostication about what the race means for Democrats and Republicans in the era of Trump and beyond. But predictions don't mean much to the millions of Texans primed to take to the ballot box this year and create yet another chapter in the state's eccentric and unique political history.